As an organization, we have been extremely busy in 2018, leading a record number of habitat restoration and artificial reef projects around the state. Together with the Building Conservation Trust (BCT), CCA National’s habitat program, and our many partners, we have made a positive impact on habitat restoration and water quality this year. We remain focused on ensuring that all donated habitat funds are spent wisely on projects where the impact of poor water quality is at a minimum, and where expected positive outcomes are the highest. Read below, and find a summary of habitat-related projects completed this year. This past October, CCA Florida joined together with BCT and Shell Oil Company and deployed approximately 1,500 tons of natural rock and concrete materials on the new Starship Reef off the coast of Jacksonville (30°10.177′ N / 81°09.351′ N). The Starship Reef, now one of the largest reefs in northeast Florida, is located in 70 feet of water and 12 miles east of Mickler’s Beach. Post-dives showed that the concrete piled up nicely, providing important vertical relief on the ocean floor. It also showed that fish such as tomtates, black seabass and baitfish immediately occupied the reef. These projects wouldn’t be possible without major partnerships and financial support – this project alone had a cost of almost $200,000. 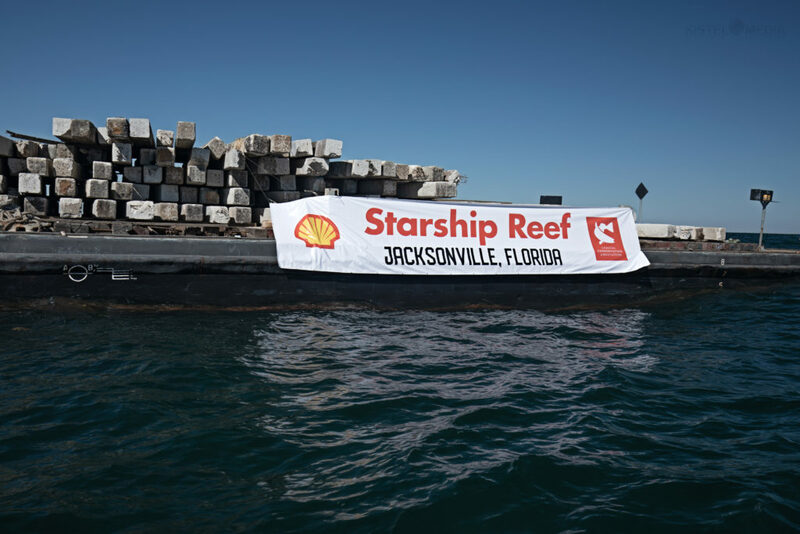 Thanks to Dames Point Workboats and Lambs Yacht Center for suppling the concrete reefing materials, and a huge shout out to Shell for their financial support, as well as donating 40,000 pounds of natural rock which was hauled from San Diego to Jacksonville this past June in their new Starship concept truck. Special thanks also goes out to the City of Jacksonville and Joe Kistel with TISIRI for helping coordinate this enormous artificial reef project! CCA Florida donated $25,000, in addition to a $57,000 in-kind match, to fund a three-year study on the declining spotted seatrout (Cynoscion nebulosus)in the IRL, with the broad objective to determine spotted seatrout population spawning status and vulnerability to human and natural disturbance in the IRL. Acoustic transects were conducted by anglers using underwater microphones (hydrophones) as trout choral displays only occur when they are spawning. Anglers recorded underwater sounds at pre-determined channel marker transects over a six-month period in Brevard, Indian River, St. Lucie and Martin Counties. The acoustic recording portion of the project successfully kicked off in April 2018 and finished in September 2018 at the close of the spawning season. A report by Dr. Grant Gilmore will be forthcoming, and the 2ndyear of acoustic recording study will begin in the Spring of 2019. If you are interested in volunteering with future recordings, please contact Frank Gidus at fgidus@ccaflorida.org. Thanks to a generous grant from Heineken USA, CCA Florida has expanded its oyster shell collection and recycling capabilities. Local Heineken representatives Courtney Maloney and Taryn Fields worked with us and funded the purchase of 240 buckets branded with our logos to be placed at restaurants for recycling oysters. Fifty of the buckets were donated to Victorio’s Oyster Bar & Grille in Longwood, Florida and they are contributing close to one ton of oyster shells per week. Our Winter Park High School Chapter members are picking up the oyster shells weekly and taking them to the Lake County Landfill to store and dry for future oyster restoration projects. Because of the importance of this volunteer work, high school CCA members are getting their required hours toward their Bright Futures Scholarships! Heineken then organized an oyster bagging event with us at Victorio’s in September, where the restaurant provided the facility and the food and Heineken provided awesome beer and swag. Over 25 volunteers made 200 oyster bags which will be used for a future deployment event at Tomoka State Park in Ormond Beach. We’ll again team up with Heineken as well as the University of Central Florida (UCF) and the State Park Service to deploy these oyster bags at Tomoka to stabilize a historic Indian midden that is eroding into the Halifax River. Follow us on Facebook to find out more about volunteering for this and other projects. As part of this grant from Heineken, they also started a campaign to help raise funds for CCA and BCT to recycle more oysters. If you purchase a Heineken or Heineken Light and oysters, you can upload your receipt to them and they will donate up to 1,000 oyster bags for restoration! The campaign, Great Taste for a Great Cause, and instructions on how to upload your receipts can be found online at https://hloysters.com. Thank you Heineken USA! CCA Florida has been working with the University of Florida since 2017 on the deployment of a new oyster reef in Hernando County. We’ve donated and delivered five tons of oyster shell to Hernando County from our recycling program in Lake County. The shells from our donation were then bagged in February during a special event by all CCA volunteers! Our oyster bags were combined with others and 2,400 bags were deployed in April in the Gulf of Mexico to form the base of an oyster reef at a permitted site in Centipede Bay. 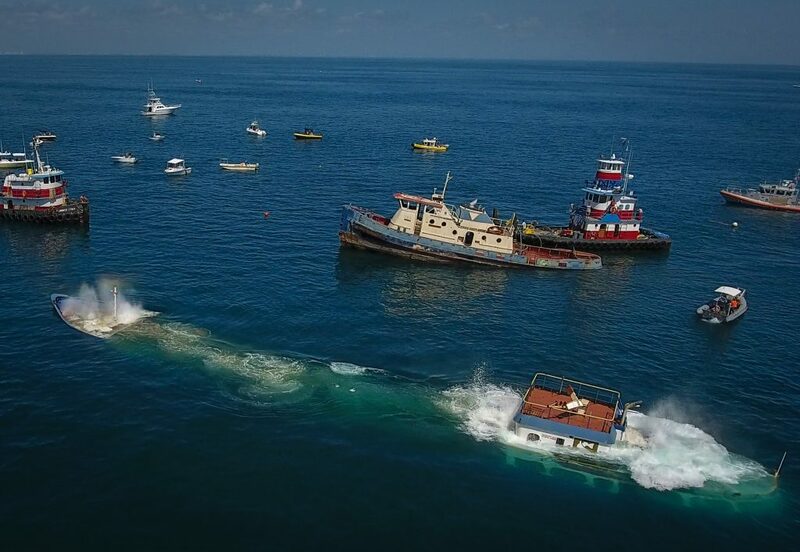 In June, the “M/V Lady Philomena”, a 150-foot steel vessel, and the 90-foot tug boat “Everglades”were deployed off the coast of Volusia County, sunk on Volusia County Reef Site 12 which is a 5,000′ x 5,000’ Federally permitted reef construction area located approx. 9 miles NE of Ponce de Leon Inlet in 75 feet of water. The Lady Philomena was forfeited to U.S. Customs in Miami after having been seized with illegal contraband. The reef started generating local excitement last fall, when Volusia County hosted a two-day viewing party that enabled visitors the opportunity to tour the ship. The deployment of these vessels will enhance this underwater community, attracting marine life such as fish, shrimp and crabs. Artificial reefs also boost local economies through an increase in tourism and patronage in small businesses. The Volusia County artificial reef system is visited by an estimated 50,000 vessels annually and experiences high visitation by recreational anglers and divers. An estimated 1,368 anglers and over 100 SCUBA divers will visit this reef annually. CCA Florida has a continuing partnership with Brevard County to support their ongoing artificial reef program, and this year we donated $1,000 toward maintaining and monitoring 24 new, five-foot high reef balls that were deployed in August. As in the past, we also wrote a grant support letter on behalf of Brevard County for an FWC artificial reef grant in which they were awarded funding. CCA Life Member Greg Harrison has been working on the Brevard artificial reef program for many years and dove the reef ball site with the county approximately one month after the deployment and observed excellent invertebrate species growth on them and observed black sea bass, juvenile red snapper, crabs, and large schools of baitfish. It’s interesting to note that not a single lionfish was observed. 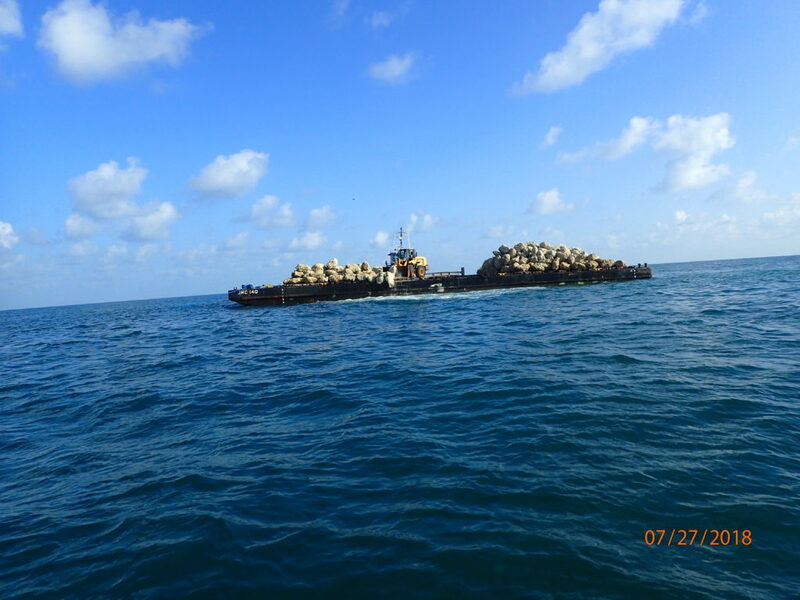 In July, 575 tons of large limestone boulders were deployed on the Larry Borden Reef in Manatee County. These natural boulders were between four to six feet in size and have created a new, highly productive fishing and diving reef seven miles west of the Longboat Pass Bridge. This is the second deployment on the Larry Borden reef site, thanks to a $25,000 donation by BCT and CCA Florida, combined with a $60,000 grant from FWC to the county. CCA and BCT’s donation accounted for 170 tons of limestone boulders on the new reef. Two new artificial reef deployments were conducted this summer off the coastline of Broward County in memorial of John Michael Baker, a member, avid diver and angler who passed away in a tragic boating accident in 2015. The projects were led by members of the Broward Chapter, who secured a five-year permit from Broward County for an area just offshore of Fort Lauderdale between Oakland Park Blvd. and Birch State Park. The initial deployment in August consisted of 665 tons of concrete materials donated by St. Lucie County. This deeper reef was deployed in approximately 160 feet of water and serves as an artificial reef for fishermen. In August, the second part of the reef project was deployed with the memorial structures in 70 feet of water. This shallower deployment serves asan underwater park for scuba divers and features a memorial structure with a plaque for John Michael Baker. This 2-part project could not have happened without funding from the John Michael Baker Foundation and without assistance from the Broward CCA Chapter, Broward County and St. Lucie County. Special thanks to McCulley Marine Services, Robert Carmichael of Brownie’s Marine Group, U.S. Concrete Products for donating the shallow reef materials, Industrial Divers for placing all the pieces together at the bottom of the ocean and to the countless others who selflessly donated funds and volunteered. CCA Florida donated $10,000 to help fund the deployment of the new Brause Girls Tugboat Reef off the coast of Martin County this summer. This project was a partnership between CCA, MCAC Artificial Reef Fund, Inc., and SHIP, Inc. The 100’ tugboat was successfully deployed in August, 7.6 miles east of the St. Lucie Inlet in approximately 180 feet of water at 27.20742/-80.00467. Less than an hour after the tugboat was sunk, divers observed that amberjacks and baitfish had already moved onto the vessel. 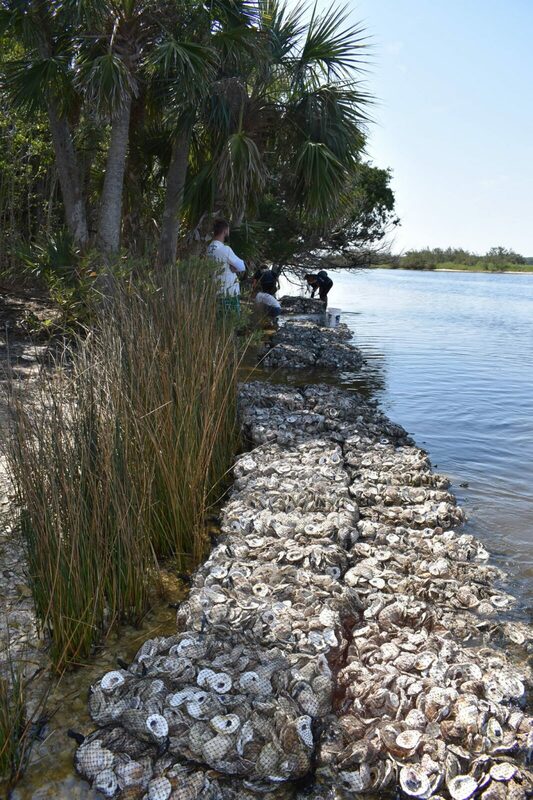 This spring, CCA Florida contributed $10,000 and partnered with Lee County and FWC to help enhance and restore nine oyster reefs through the addition of large washed fossil shell and oyster shell. The restoration areas range from 0.14 acres to 0.96 acres in size.The restored oyster site in San Carlos Bay will be compared to control and natural reference sites to allow testing of goal-based hypotheses using a BACI (Before-After-Control-Impact) design. This design has a temporal component to allow statistical comparisons before and after the construction occurs. It also allows the constructed oyster reef to be compared to nearby reference sites and other similar sites which have not yet been subject to restoration efforts. CCA Florida donated $6,625 to UCF to fund Phase 1 of this new living shoreline stabilization project. Timucuan Native Americans occupied this area for many hundreds of years and created middens – mounds of oyster, clam and other shells and bones that extended 40 feet high along the shores. The current highly eroded shorelines are all historic midden-dominated areas dating back to the Timucuans, making it extremely important to protect these shorelines and artifacts. Phase 1 was successfully completed on the western shoreline of the park in March by UCF and our volunteers.The objective of this project is to implement living shoreline techniques using planted mangroves, smooth cordgrass and oyster shell as recruitment substrate, to restore an eroded area along the shoreline of Tomoka State Park. This summer, CCA Florida donated $5,000 to Sarasota Bay Watch (SBW) to sponsor the restoration of 50,000 clams back into Sarasota Bay. SBW is working to restore clams and scallops to the bay with these important filter-feeders that play a critical role in mitigating poor water quality. They actually eat red tide and other algae, sequester carbon, filter up to 10 gallons of water per day, and provide food for other marine life. Each of the 50,000 clams is over 2-inches in size and according to Dr. Bruce Barber, Executive Director of the Gulf Shellfish Institute, a single 2-inch clam filters out 50,000,000 red tide organisms per day. That equates to 2.5 trillion organisms per day for the 50,000 clams. To date, SBW has released 143,000 clams in the bay that collectively are capable of clearing over 7 trillion (7,000,000,000,000) red tide organisms every day! CCA Florida partnered with Swamp Head Brewery again in 2018 for the second year of the Trash Tour. 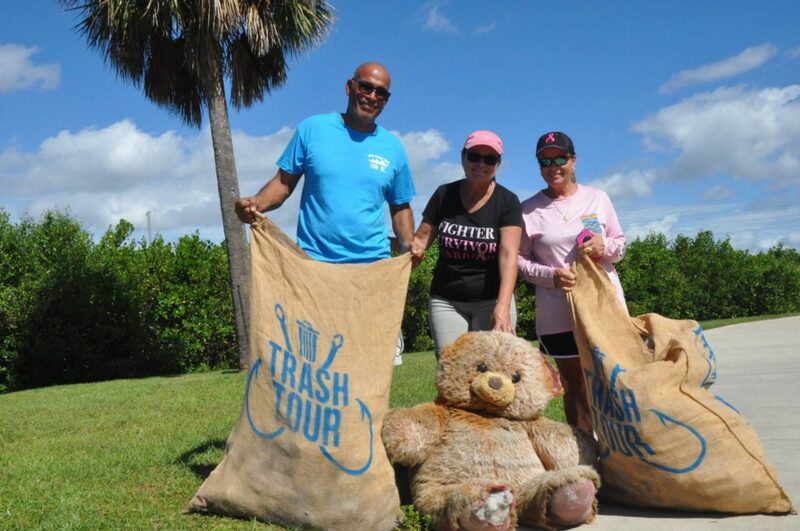 With four stops around the state completed this year, over 200 volunteers participated in removing more than four tons of trash from our local coastal waterways. The four locations included Ft. Lauderdale, Tampa, Port St. Joe and Charlotte Harbor. Each participant in the Trash Tour filled their hands with a Swamp Head beer, freshly prepared food, tons of free goodies from our amazing sponsors and a day of competitive display of coastal conservation. A huge thank you to our title sponsor, Costa Kick Plastic, and all our sponsors including Hydro Flask, Academy Sports + Outdoors, Power-Pole, Cheney Brothers, Publix Supermarkets, and Waste Pro. Please join us for the 2019 Trash Tour with locations and dates coming soon. CCA Florida and Ocean Aid 360completed the first of six Ghost Trap Rodeo events on in October at Ft. DeSoto Park in Pinellas County. With the help of 37 participants, 25 abandoned crab traps were removed from Tampa Bay along with over 400 pounds of other marine debris. 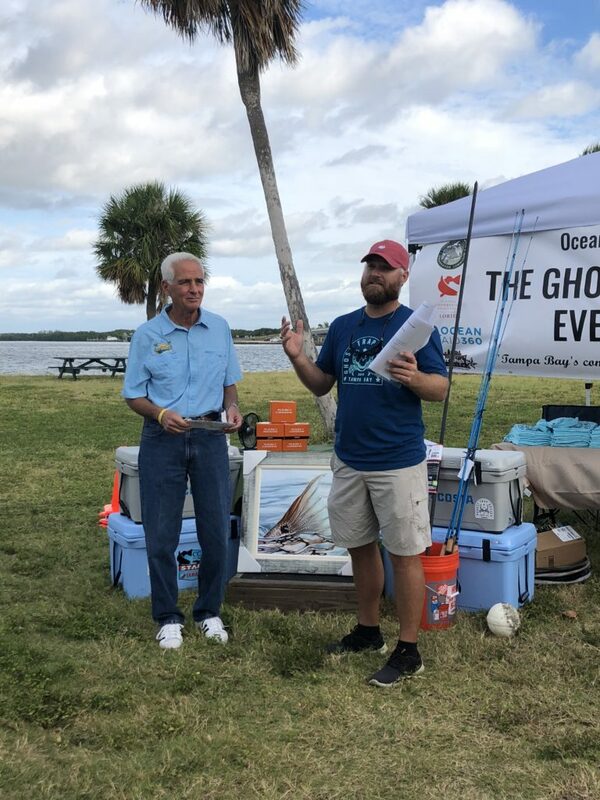 Congressman Charlie Crist joined the event to express his support for this ghost fishing/marine debris intervention and to serve as our Ghost Trap Rodeo Grand Marshall. By pulling these 25 traps, local angler-volunteers limited the cycle of ghost fishing in Pinellas County waters resulting in reduced mortality of marine life by-caught in the lost traps and improved the estuarine habitat for future generations of marine life. Volunteers also won a lot of great industry-sponsored prizes valued at nearly $5,000 in retail value! We have four more Ghost Trap Rodeo events scheduled around Tampa Bay, one per month until March 23, with $25,000 in prizes over the six events. For more information and upcoming dates, visit oceanaid360.org. Oyster reef restoration – 428 volunteers for 3126.5 hours. Living shoreline stabilization – 778 volunteers for 3399.5 hours. (Since 2005) Oyster reef restoration: 50,049 volunteers. (Since 2010) Living shoreline stabilization: 9,850 volunteers. Alongside our advocacy efforts, habitat restoration initiatives play a role in our state’s water quality and the health of our fisheries. We’re proud to lead this work, and when coupled with other efforts, we know these projects will help lead to recovery. 2019 is shaping up to be even busier than 2018 with many habitat projects and artificial reefs already planned. If you have an idea for a habitat project in your area or would like more information on any of our completed projects, please contact Frank Gidus at fgidus@ccaflorida.org.